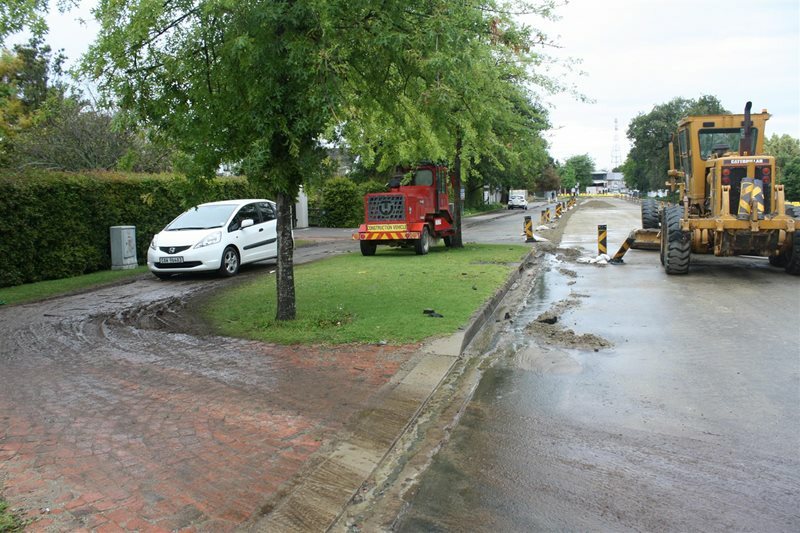 Hilland environmental consultants issued the following statement in response to a complaint of a motorist about the road works in Caledon Street published last week. The closure of the top end of Caledon Street is part of the reconstruction programme of the whole street. GEORGE NEWS - The following has always been the plan and proposed work method for the project and motorists have been advised on numerous occasions of the work method and programme, through the press and through the letter drops and e-mail communications. Due to the nature of the road, the requirement for access to residents, and traffic accommodation, the construction would take place in phases. Each phase entails removing the current asphalt layer, removing the subbase layers, importing new subbase material, compacting and stabilising these layers, priming the new surface, and then placing the BTB layer (the current black surface that people are driving on in the middle section). Work would be completed to the BTB layer, which is NOT the final road level or finished asphalt layer, for each phase. Once all the phases are complete to the BTB layer the final asphalt layer would be spread over the whole road. The BTB layer is not the final level and there will be level changes around the manholes (which need to be at the final road surface level) and the kerbs (which need to be at final road level). The first two phases were done on the right and then left hand side of the middle section of Caledon Street - during this time a stop and go was in place while both lanes of the road were rebuilt to the BTB layer. During this time the top and bottom sections of the road were unaffected by any construction and remained open to traffic. Once the middle section was complete to BTB level in both directions, residents and road users were reminded that this section would now be opened to two way traffic, the affected side access roads would be reopened and that the top and bottom ends of Caledon Street would be closed to all traffic so that they could be rebuilt to the same BTB level as the middle section. Special arrangements for access to the residences and the library and church would be in place during this time making use of the sidewalk area of the road reserve. Once the whole road has been constructed to the new BTB level (and due to the Christmas break) the whole road will be reopened to traffic from 14 December to 7 January. During this time ALL traffic will be allowed to use the road but it will not be at the final asphalt layer and there will be level differences around the manholes and kerbs. Road users are cautioned to drive with care. After the Christmas break the road will once again be subjected to traffic control while the final layer of asphalt is placed over the entire length of Caledon Street. The repair to sidewalks and driveways that are required will be completed after this final layer is complete. Finally, after the final layer of asphalt has cured, the road markings will be repainted and George residents will have a beautiful new and strengthened Caledon Street that is designed and built to accommodate the buses and other vehicles that use it. There have been numerous delays to the originally anticipated construction programme and these have mostly related to the moisture content of the layers and periods of waiting for the layers to reach the required moisture content for work to continue. Where the moisture levels were noted to not be correct sections were identified that required additional attention and in certain instances redoing. Rain delays and consequential rain delays (waiting for drying out) are normal in any contract and are worked into the programme.